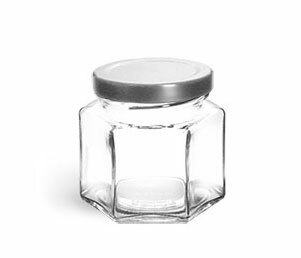 A case of our hexagon glass jars comes with silver plastisol lined lug caps. Plastisol liners have the ability to create a seal between the cap and jars when suggested heating methods are met to help ensure the freshness of your product. These glass jars may be used for a variety of products including jellies, jams, honey, and candles. All of our glass jars are packaged in cardboard boxes and secured by cardboard dividers to prevent damage.